For a such a simple little concept, the divergence-emergence-convergence model we use in the Art of Hosting sure packs a punch. It is a simple teach that can be done in 10 minutes – or longer – if time, space and the opportunity to engage others in the conversation allows. It sheds light on design process, the groan zone and people’s experience. Navigating the groan zone is an art form that often arises out of our ability to host ourselves well. Stories from a recent Art of Hosting training a bit later in this post. First a bit about the model. The divergent phase of this model is akin to brainstorming. We want as many ideas as possible to emerge so we can later select the best ones to develop further. It has much broader application than brainstorming though. It is about expansion. It is where ideas are generated, information is collected, issues or challenges are sensed into to gain more insight or shift perspective or simply where we holding open the space for possibilities to enter in. It is not a time for evaluation. We don’t need to know what we will do with the information. We don’t even need to know whether the information is ultimately useful while we are in the divergent phase of the learning, the work, the project. As we begin to feel overloaded, overwhelmed or uncomfortable, or we begin to question “the process”, or the leaders or hosts of the process, or we are just tired and grumbly, we are desiring understanding and often looking for convergence. What does it all mean? What should we do now? When can we be done? 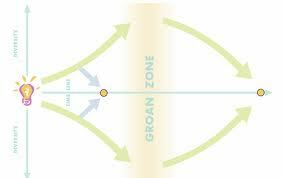 All questions that indicate we are near or in the groan zone. In an effort to avoid discomfort, end discussion, or just get to the end now, we are often tempted to circumnavigate the groan zone by picking an idea, or a solution prematurely – any reasonably good one will do – and developing it into “the answer”. Some things happen when we do this. One is that we may miss the truly important things. By prematurely closing a conversation, the essence or pattern of it often comes back. We think we made a decision but the decision is questioned and we end up in a new round of conversation about things we thought were settled, growing frustration and dissatisfaction later on. Staying with the discomfort just a bit longer might emerge a different idea or opportunity or a new understanding of where are at and why. What if we became curious about where we are instead of wanting to shut it down? What might then emerge? What if we ask the question, what else is going on here? What is underneath the conversation, the unrest? Navigating the groan zone is an art of discernment in many ways. It is also a skill we can develop. I recently had someone send me a note, asking me how a training was going. The note arrived exactly in the groan zone at the end of day 2. I thought about replying and knew it was just impossible to explain succinctly where we were in our process – unsettled, a bit disconnected as a group, unclear about what all was bubbling. Sure enough, the next day things flowed together, the group became more cohesive and new possibilities emerged. I had a new story to share about the groan zone and the importance of staying in it in our processes, not prematurely attempting to assess the success or failure of a conversation, a training or a process. We don’t just need to stay tuned to the groan zone, we need to be alert for convergence and good timing of it. A couple of stories about the groan zone from recent hosting experiences. These two stories come from the first AoH training for Rio de Janeiro in Brazil at the end of April 2012. Two of my co-hosts (on a team of nine) were Jerry Nagel from the US and Maria Barretto from Brazil. The first story is from the hosting/calling team. We met, as is normal practice, the day before for our check-in and design process for the training that was in front of us. In the couple of weeks just before the training, it filled so rapidly most of us had no idea we had reached our capacity of about 50 people in the lovely retreat centre we were at near Petropolis. Even in this last night before we were to begin, people were sending emails saying they wanted to attend. In the normal flux of what happens leading up to a training, some people were appearing, some were saying they couldn’t come and we were left trying to figure out what to do. We had five people on a waiting list. There were two possibilities: begin the list for the next Rio AoH or refer them to an AoH that was to happen in Sao Paulo a few weeks later. We circled around a decision several times, even as we tried to move on, but never landed. We were clearly in the groan zone. Maria was the first one to suggest this conversation was not about numbers, there was something deeper that maybe we needed to become curious about and pay attention to. After two hours we agreed as a team that we would just say yes. Full invitational energy. You want to come? If you can still come we will figure out how to make room. Calls went out to the five people, three of whom showed up the next morning, two of whom had a 7 hour drive to make it happen. What was our conversation about? Letting go. Inviting. Trusting. When we entered full invitation, we passed through the groan zone as a hosting team. Something shifted for us. Beyond the decision itself. Into the collective space of being a team. The second story – this time from the full group. Day 3 of a 4 day training. The morning is all about hosting self – embodiment, art, silence. Not everyone is comfortable with meeting self. We decide not do a collective harvest of the experience but to leave it with individuals. The afternoon is Pro-Action Cafe – one of the best I’ve ever seen as my Brazilian friends take it to new levels, engaging the participants while the conversation/project hosts are reflecting on what they have learned so far. “What does it feel like to host other people’s dreams?” is the question they ask, a question that touches me heart. After the proaction cafe, we enter a debriefing space. It’s been a long day. First comments are quite positive and excited. Then there is a shift. The comments and questions that are now coming into the space do not, in my perspective and through translation, seem to reflect the proaction cafe experience. So, I become curious. As I pay attention, I begin to wonder, what is the level of discomfort from the morning experience that seems to be bubbling up now? From here, I am not really sure where we want or need to go next. I invite the hosting team into a transparent conversation about how we want to proceed. There is one more thing we had been planning but we are now into the time for that process. Things take on a life of their own and we enter into a fishbowl experience. I’m still not sure how that happens, but we flow with what is emerging in the space. As a host team we have a little conversation about what will serve best now. Participants enter the fishbowl and offer their experience and their questions. One person asks, “Why don’t you, as experts, just tell us what to do now?” Good question. We invite it to sit in the room with us til a bit later. After hearing from more people one clarity emerges for me. I want to be sure we honour the stepping in of volunteers to host processes they had never hosted before and I feared itt was being lost in the ripples showing up in this groan zone. The response to the question of why we didn’t just provide the answers for people? “Looking for someone to provide the answers is a typical reaction when we are in the groan zone. Learning to co-sense and co-learn into what is needed next is the learning edge we are all on. An answer too soon might not be what we need at all.” People are nodding. As we have heard the feedback and sensed the room, I suggest maybe we need to wrap up. One of the desires in the room is to end for the day and dance – beautiful Brazilian circle dance. Jerry states, with a beautiful level of intensity, “I didn’t come all this way to just stop and dance now. There is more learning to be offered.” People around the room nod. This is another thread very present in our space. Maria finally suggests we wrap up for dinner and, for those who want to, we will reconvene after dinner to hear stories of where the methodologies have been used and the impact of them. This is ultimately the path we choose. Pretty much everyone shows up for the evening of storytelling. There is a hunger in the room. It is a good call. In the middle of the groan zone we modeled how we can hold the intensity of it, offer up various points of view, and maintain integrity and depth of relationship in our field. We feel the relief in the room and we know the tension we have been holding in this moment. Many people later thanked us for modeling what we speak about, that it was a powerful moment for them. The next morning, we know we need to converge well. We invite triad conversations as a check in. People are asked to reflect on their greatest learning and how they are going to take their learnings home. It is a powerful convergence moment as people reflect on their experience and how to apply it. Convergence is not necessarily something that happens half way through the process as is depicted in the diagram. More likely it will happen 2/3 or 3/4 of the way through. And, when we have navigated the groan zone well, it happens swiftly. In a lot of our planning processes, I will often say they are front end loaded. If we take the time to sense into what is needed, and the time to be in conversations that take time, with the curiosity about why, we create the conditions for “magic” to happen. I’m not sure I’ve ever been in a process where “magic” happens when we haven’t had to navigate the groan zone with attunement, patience and awareness. There are ingredients that lend themselves to magic and navigating the groan zone with presence, patience and attunement are some of them. It is sometimes the most challenging space we hold, but the rewards are bountiful when we do it well. And whether we do it well or not, the learning is rich. It is the last morning of our 3 day Art of Hosting training in St. Paul Minnesota in mid April 2012. We have 40 participants plus our 6 person hosting team which includes 3 apprentices. The hosting team is starting our day by checking in. Day 2 was a good example of a groan zone kind of day. The field felt a bit disconnected from itself. There were little rumblings here and there that had been showing up since our opening circle on Day 1 that had our attention a bit and certainly our curiosity. At the end of Day 2 during our check out as a hosting team, we noticed some of the dynamics that seemed to be in play, felt we didn’t have enough information to make informed determinations of what may or may not be in the field and let it go as we left for the day. On this last morning, the person hosting our check-in asks, “What are you anticipating in this day?” The question gives me pause, although I’m not sure why — until I begin to answer it. I start with, “Well, I’m anticipating a few good conversations with individuals – some of whom have already been identified.” I hesitate. What else am I anticipating in this day? What do I want to anticipate? Ah. That is a good question. My clarity begins to emerge. I continue, “I don’t think I want to anticipate anything else. We know there are some dynamics in this field. It is not fully clear what they are so I think I don’t want to anticipate anything. What I do want to do, is be fully present and attentive, ready to tune into whatever emerges that needs tending, but without anticipating now what that might be.” This sentiment seems to resonate for all of us on the hosting team. An invitation into being fully present, to not speculating, to not imagining how carefully we need to tend the field for certain things. The first of the four fold practices – being present. The Four Fold Practice is a core pattern and practice in Art of Hosting and it has been receiving renewed attention lately in our teaches and our conversations. Self hosting. Not just being nice to self by going to the spa or eating dark chocolate. Depth. Practice. Discipline. The discipline of practice. Meeting oneself, sometimes in places one would prefer not to meet oneself. Being present is fundamental to good hosting. This I knew. What happens next for us as a hosting team is what has me reflecting still on the power of presence and what it means to hosting and, more than that, for me anyway, what it means in my life. As a team we decided not to try to figure out what may or may not be going on in the room, or who was holding the threads of what dynamics, but to let it go to sense into what was alive in the moment allowing us to more powerfully engage the next two folds in the practice – participating fully in those one-to-one conversations and contributing to the larger hosting process. Following our check in, I was coaching the proaction café team. It was a large team, a bit chaotic to start, but everyone managed to find a role that worked for them with several teams of two hosting different sections. I went off to find the members of the team to check in with them about their role and what, if anything, they needed from me. In entering the room, I began to encounter some of the people who seemed to be holding some of the threads of discontent and disconnect that had been popping up over the previous two days. Spontaneously. I didn’t seek them out. I’m not even sure they sought me out. We just bumped into each other. In this spontaneous connection in even just five to ten minutes, a depth of human to human connection happens on the level of story, being able to see and witness some extraordinary part of an individual’s journey. What is even more surprising is that this spontaneous connection happens for many of our host team members. What we notice alive in our field now is that the threads of discontent and disconnect seem to dissipate and disappear. They don’t go underground as often happens when not addressed, but they seem to disparate in the depth of human connection. People feel seen, heard and acknowledged in their journeys in unanticipated and beautiful ways. Then, the proaction café weaves people, their stories and their gifts together in a beautiful way. Nine projects/ideas expand in delightful ways. The conversation hosts feel gifted. The participants also feel gifted and honoured with holding and exploring other people’s dreams, realizing the power of contribution even when not directly connected to someone else’s project. One of the roles taken on in the proaction café is the deliberate and intentional holding of space – or the energetics in the room. Two women stand on either side of the room, visibly and silently witnessing the room and hosting space. When we debrief, they are asked to share what they have been doing and what their experience has been. They describe the honour of it, of seeing the weave in the room, of deliberately fueling it with positive intention and love. 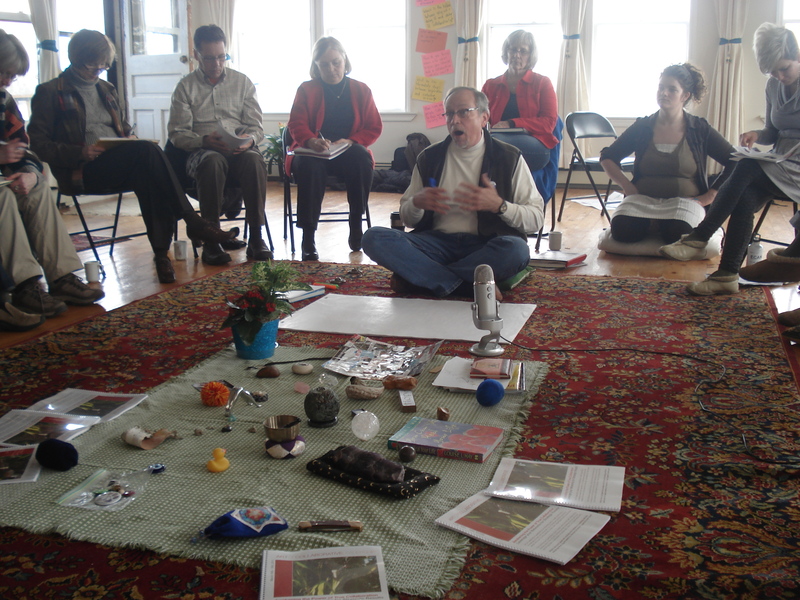 Participants describe their experience of it, what they feel corresponded to what they heard from the hosts of the energetic space. It was one of the most deliberate explorations of what are we hosting really that I have been part of. When we do our closing, as often happens, we become aware of how powerful the three days have been for many who are there. We are reminded of the power of the groan zone and how our assessment of where we are in our process influences our interpretation of whether we are successful or not. On a day that ends in a groan zone it doesn’t always feel on track or successful. Seeing the convergence in the next day reinforces the beauty and possibility of the groan zone. I’ve been through enough groan zones that I should know this but it is always a renewed awareness. As we close our hosting team circle at the end of the day, we bring curiousity about what has happened and a fresh wondering about the Four Fold Practice and the power of presence to shift the shape of the field and the possibility it can shake out some dynamics without needing to dive into them. Is that what happened? I don’t know with absolute certainty. That’s my continued reflection. Will full presence always be enough to dissipate shadow on its own? Happy to experiment more to discover – rather than anticipate the answer to that. This experience has me reflecting on hosting self, specifically myself, my life and my relationships. How often have I said about a situation, relationship or person, “I’m optimistic that…” or “I’m not optimistic that…” What is the anticipation that gets built into those kinds of statements? What if I just met that situation, relationship, person, myself, in the moment of the experience and not as a precursor to what might or might not be but attentive to what, if anything, needs to be tended to in this moment? How would this ongoing presence shift the shape of my experience now, shifting the shape of my relationships and my situation? I am deeply appreciative for the question, “What am I anticipating?” It has made me aware of how much I do anticipate and how a lot of that does not serve. The only journey I really need to pay attention to is mine. Another person’s journey is not really my business and is certainly not my journey. My journey intersects with others, but they don’t define mine unless I let them. I don’t define theirs unless they let that happen. Letting go of analysis and simply tuning in at the moment supports what wants to happen rather than fuels my own anticipation of what might or might not happen, possibly feeding something that didn’t need to be fed, creating something where it might not have existed except that my/our anticipation brings it into being. Still ruminating on this one. Powerful lessons from the field on being present.